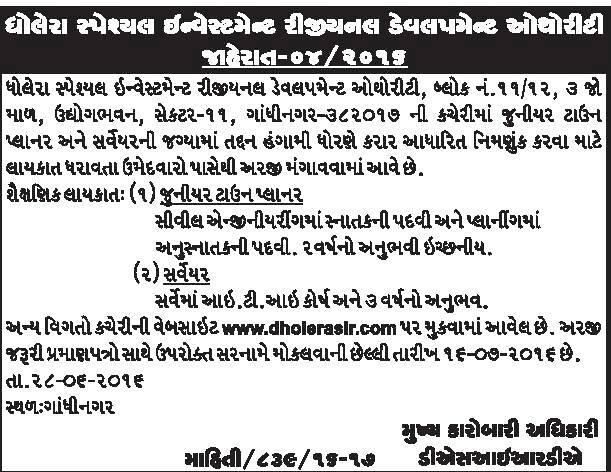 Dholera Special Investment Regional Development Authority (DSIRDA) has published a Advertisement for below mentioned Posts 2016. Other details like age limit, educational qualification, selection process, application fee and how to apply are given below. Civil Engineering Graduation Degree and Post Graduation in Planning. 02 years experience required. I.T.I. Course in Survey and 03 years experience required. Address to sent Applications : Dholera Special Investment Regional Development Authority (DSIRDA), Block Number : 11/12, 3rd Floor, Udhyog Bhavan, Sector - 11,Gandhinagar.